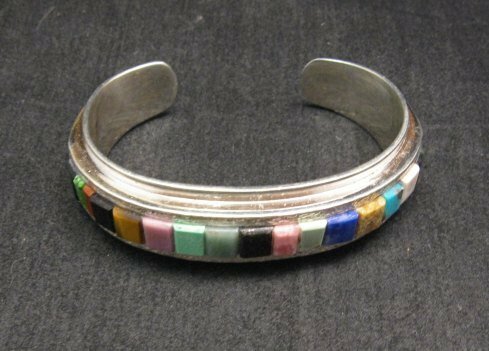 Hopi sandcast bracelet with Loloma-style multi stone inlay, created by Hopi/Pima artists, Bennard & Frances Dallasvuyaoma. 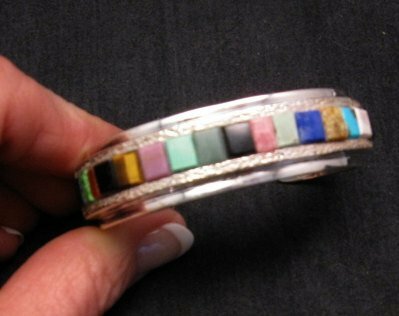 They call this bracelet a Rainbow bracelet. 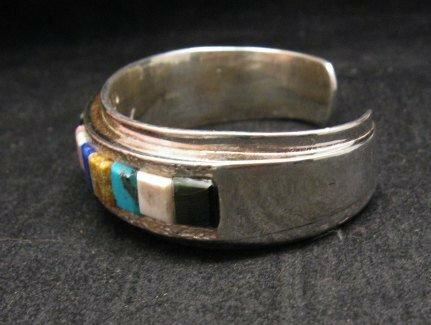 It is inlaid with turquoise, tiger-eye, purple phosphosiderite, jasper, fossilized palm wood, Wild Horse Jasper and more. 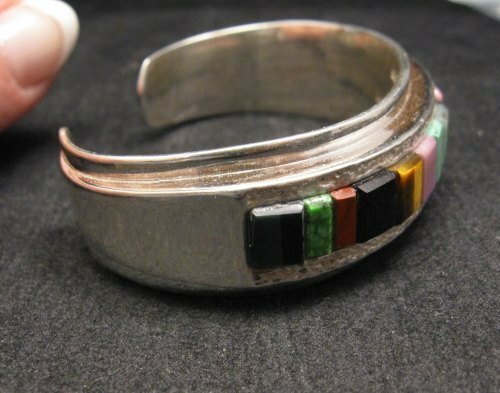 The inlay is raised above the surface of the bracelet. 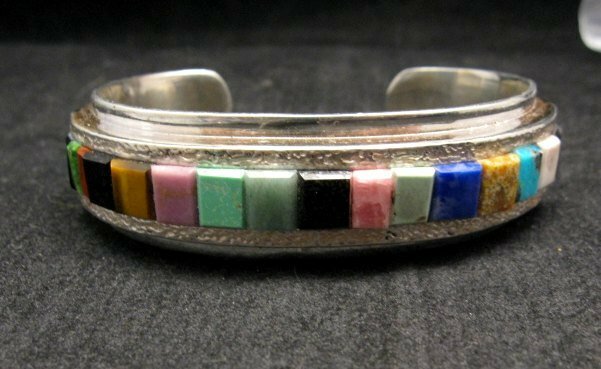 The stones are encased in sterling silver cast in sandstone from Hotevilla on the Third Mesa. The sandstone creates beautiful settings of textured metal which contrasts with the smooth surfaces of the gems. 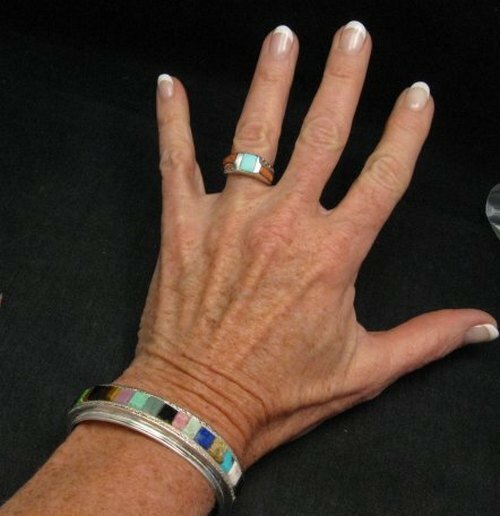 The bracelet measures 5/8 wide with an inner end-to-end measurement of 5 plus a 1 non-adjustable gap. It weighs 58 grams. Brand new and in perfect condition! Certificate of Authenticity and gift box included. Purchased in person directly from the artist, Bennard Dallasvuyaoma. 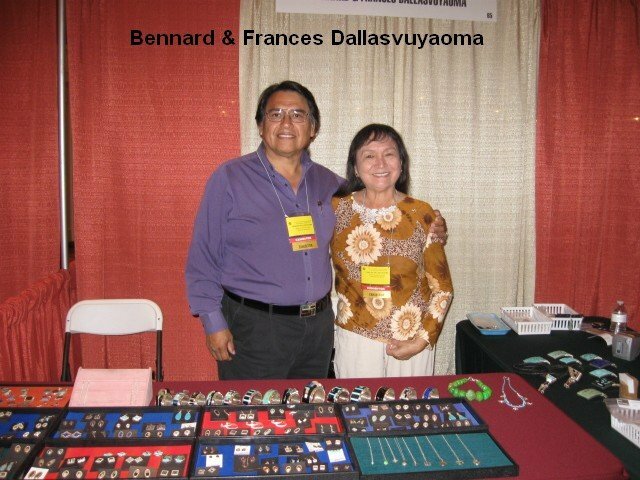 Bennard represents a recent generation of jewelers inspired by Charles Loloma, who was his uncle.